38 Form of Chen style tai chi - Bok Lei Po Trading Inc.
38 Form of Chen style tai chi-Chen style tai chi quan is one of the ancient schools of its kind, it's extremely popular among tai chi practicers all over the world, chiefly for its qnique movement and action, soft but firm, wrapping and retreating. 38 form chen style tai chi quan is the basic for those who want to practice Chen style tai chi quan, created by Chen xiaowang, the 19th descendant of Chen's. the program of wushu is made up of 38 postures, which are easy to practice and set as a required course of higher education. 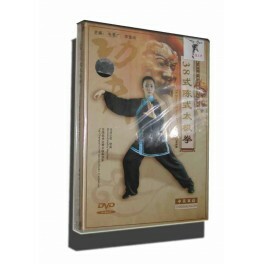 the progam with precise and detailed demonstration, serves as excellent couse of wushu. English and Chinese.